Where is the Milky Way in our universe? 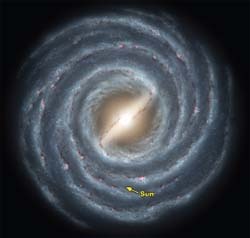 The Milky Way sits on the outskirts of the Virgo supercluster. (The center of the Virgo cluster, the largest concentrated collection of matter in the supercluster, is about fifty million light-years away.) In a larger sense, the Milky Way is at the center of the observable universe. This is of course nothing special, since, on the largest-sized scales, every point in space is expanding away from every other point; every object in the cosmos is at the center of its own observable universe.